The natural stylings of this Soft Scraped Engineered Hickory hardwood floor create a sense of comfort and serenity. The exquisite definition of graining and natural color tone capture the visual elements of nature. Available in 5 in. width, engineered hardwood planks with beveled edges and eased ends create a great fit with any style decor. This Mohawk flooring meets all environmental standards and is CARB II and Lacey Act compliant. Features Scotchgard Protector Advanced Repel Technology which provides long-lasting protection that keeps your floors looking newer, longer and makes them easy to clean. 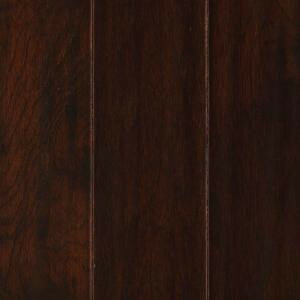 Buy online Mohawk Chocolate Hickory 3/8 in. T x 5 in. W x Random Length Soft Scraped Engineered Hardwood Flooring (23.5 sq. ft. / case) HEHS5-11, leave review and share Your friends.